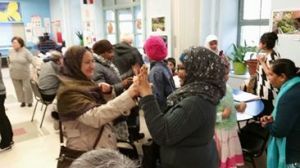 Our Public Housing Organizing Project builds power of Bengali, Chinese, and Korean public housing residents living in Queensbridge to engage civically and hold the New York City Housing Authority accountable. Our NYCHA leaders fight for language access and improved NYCHA conditions, create community to challenge isolation, and participate in a larger multi-racial fight for public housing preservation. CAAAV volunteer Rasna and Queensbridge tenants participating in an icebreaker. Why We Need the Public Housing Organizing Project! There are 20,000 Asian residents in NYC’s public housing. For thousands of Asian limited English proficient residents, NYCHA has only two Chinese interpreters; leaving LEP tenants unable to access housing services. In 2014 CAAAV, collected 221 surveys and four in-depth profiles of Asian tenants throughout Queens, Brooklyn, Manhattan, and Staten Island. Tenants reported: slow response times or no response for small to major repairs; language access issues in services and documents; and, like other tenants, overall disrespect by the management. Tenants expressed the desire for community to challenge their sense of isolation from the rest of public housing’s English-speaking residents. 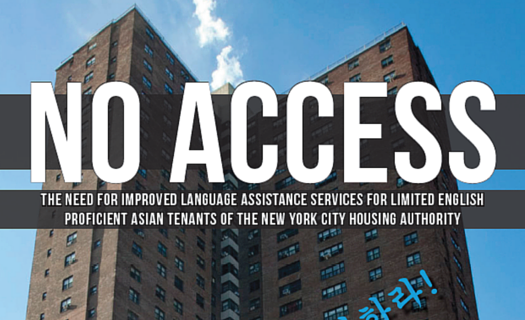 In 2014, our NYCHA Project published No Access: The Need for Improved Language Access, the first ever report on the experiences and policy recommendations of Asian immigrants in public housing leading to NYCHA adding Mandarin and Cantonese to their Central Call Center in addition to English and Spanish reaching tens of thousands Chinese residents. This win has opened the opportunity to push for other Asian languages (e.g. Bangla and Korean). Language Access Report to learn more. What the Public Housing Project is Up to! Building relationships with Tenant Associations and local organizations so Asian tenants can collaborate with Black and Latino tenants for broader, multiracial NYCHA accountability and preservation of public housing. DONATE TODAY to support language justice and community building!